The Big Family of Simone and Ingrid, and Simone's father Gianni and team at Osteria Monte Baldo Verona, love the culture of their city, their food and guests! 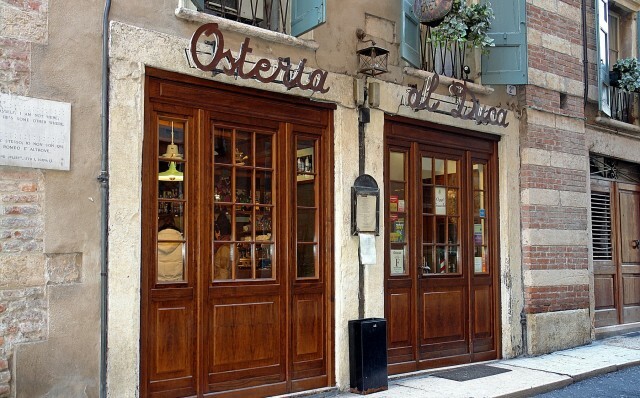 "At the Osteria, in addition to the tartine, we have about 30 to 35 items on the menu, that is a very big menu, yet the dishes are homemade and real traditional from Verona. When I went to America and in particular New York's little Italy, I realized that Americans had a very different perception of REAL AUTHENTIC ITALIAN food...yet you can fly here and try mine,now!" he laughs and I am very hungry now! 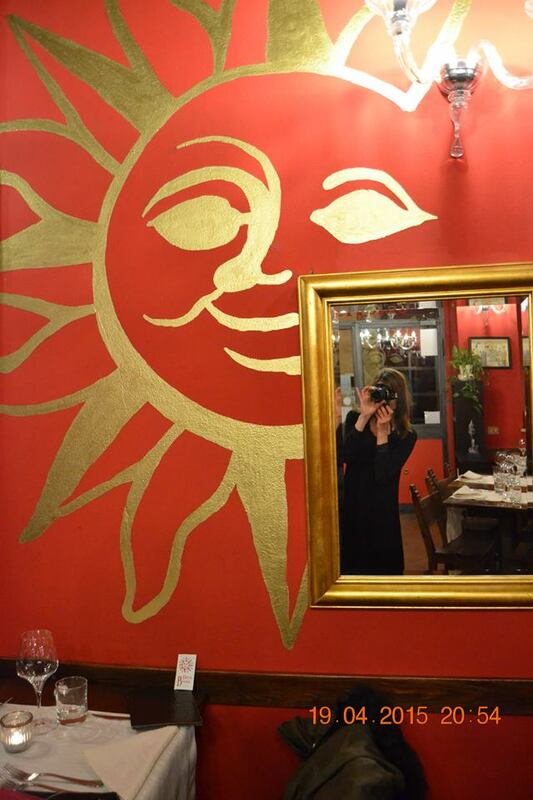 As you can see from the elegance of the vision behind the wine glass, the beauty and formality of the Restaurant La Piazzetta in Verona is well earned. 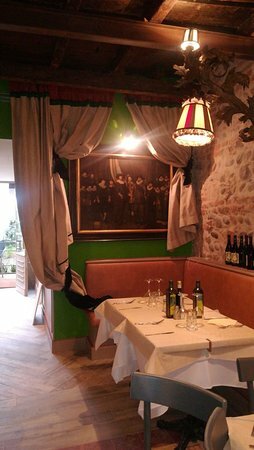 It is a very lovely restaurant to dine at with high quality products of Italy and homemade sauces, ragu, breads, pastas from the Osteria Monte Baldo Lab, of which the family provides both Osteria Monte Baldo and the La Piazzetta with. "The Ristorante La Piazetta is a collaboration of me and my father, who isn't a old school strict I have to do things my way Italian!" laughs Simone, who is just a peach of a sweetie when it comes to people in the world. Along with his wife, Ingrid who worked at the Italian Embassy in New York 4 months, they share a love of New York and America and a business together. "My father, Gianni started the Caffe in 2003. In 2015 we started the ristorante together along with the Monte Baldo Lab where we make the products that we serve to the guests in each of the places. That way we and the guests can be sure that the food that we eat is of the highest quality. And it is pretty funny that the people love to come the the Monte Baldo Lab and buy bread to take home or pasta or ragu sauce, all of which they can do of course." Is he or his wife a cook? Simone laughs, "My wife is the restaurant and osteria's CFO actually!" Here Simone, the very happy with life person that is the Capo of the 3 places in Verona, is proudly standing with his creations. "I am most proud that we make it all by ourselves, the food. And the wine is 70% Venuta and 90% Italian. 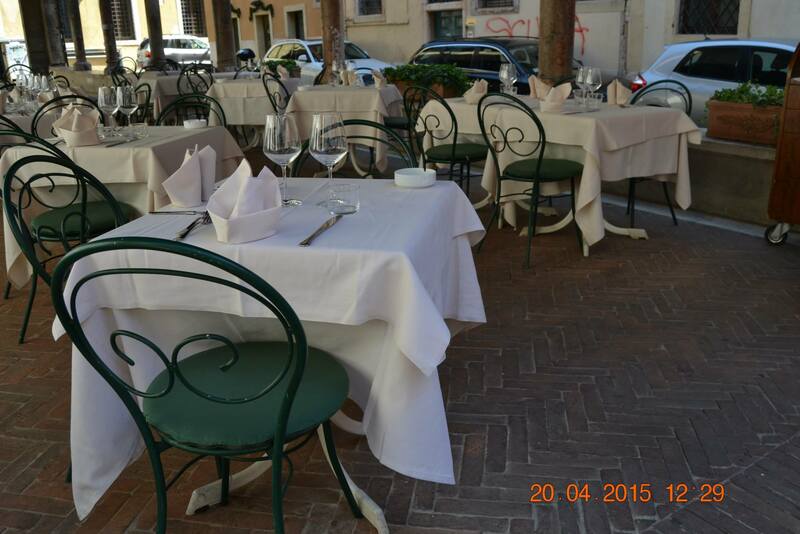 The Ristorante is Verona regional food in the winter and Venecian in the summer. Why?" he smiles and starts to laugh,(he laughs all the time and you laugh with him) "Because funny enough the Americans and especially the English become highly offended if they see the horse on the menu. And the donkeys? Forget it. 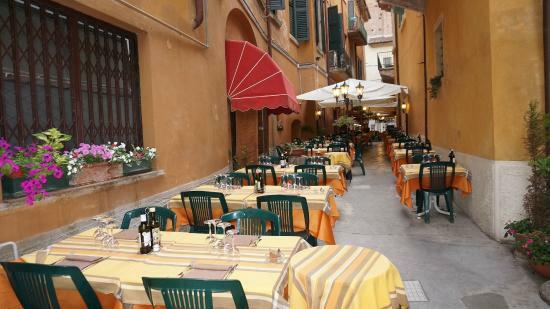 The Verona culture is to eat donkey and horse as delicacies, yet the tourists not so much and we cater to the seasons." For 5 years I have walked down the alley near Tre Marchetti and outloud spoke lavish praise of its beauty. To say that it is one of the lavishly beautiful restaurants of the world is true, yet the team is hilariously funny starting with the current Capo, Matteo. And yes they have been Michelin the last 10 years, including a star from 3 years. "The restaurant is in my family 80 years and it is a funny story, yet let me tell you of the summer opera season that essentially starts at midnight every night and last til 4:00am. All of the audience and stars from the Arena next door come to the restaurant at midnight. That is about 100 people every night in addition to the usual lunch and dinner, yet all the stars sing here. I am a pretty good opera singer and have joined in every night. We have pictures on the wall of the known ones around the world such as Placido Domingo and Lucian Pavorotti, yet one night a couple asked me to sing because it is a man's wife's birthday." starts the funny story. "The funny story of my mother and my birth is that I am almost birthed in the restaurant here. The night of my birth, April 9, my mother is cooking in the kitchen and standing over a big fish. She rushes to the hospital and I am born on April 10, and one week later I am in a basinet and my mother is back in the kitchen!" he says and I ask if he loves fish now? He starts laughing, "No I don't care for fish." he says and I say that is because he blames the fish. 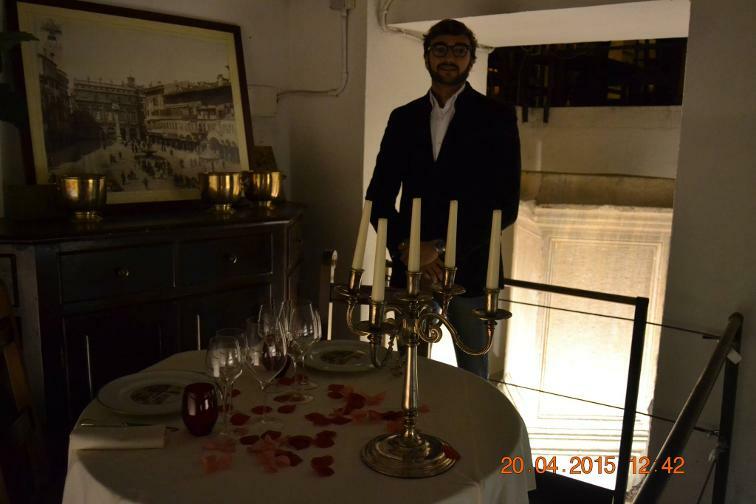 "The glasses are water glasses set on each table and the guests love these, with the gold trim goblets that they can purchase from Murano from us for 300.00euros a box of 6," says the waiter Roberto proudly. Since it is the very first luxury item that you notice as you walk down the alley and see the tables outside, they cause quite the stir. "I keep imagining my years here that the cars will pass and grab the glasses in a Murano glass heist and keep going!" he says laughing and I say O that is a lovely idea! The famous Mexican Tenor posing with Matteo outside the lovely Tre Marchetti, Ramon Vargas. "Yes I have many of the famous ones here all the time and last week Botero and his wife came. I didn't recognize him and thought him to be very nice and friendly and at the end of the meal he asked if I enjoyed his sculptures and I asked who he is. When he said that he is Fernando Botero I am very impressed I said." I of course LOVE BOTERO and tell him the story of his son. "You know the Qatar Royal family came here, His Highness Al-Thani and they love horses and a relative is in the Horse Jumping Show that is internationally famous here at Verona every year, along with the Famous Wine Show. They all came in, people from the United Arab Countries and they all loved to tell stories of their horses. When I had to present the menu I felt ashamed since Cavallo is on it and I explained that it is a Verona tradition since Napoleon. They nodded, yet they ordered other items!"" he says and I say I don't think that they would order Secretariat on the Menu. 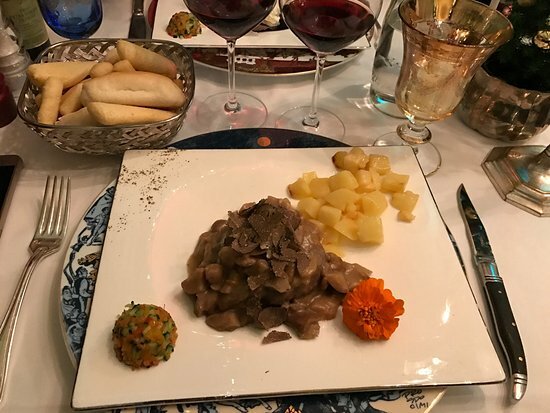 White Truffles with Bigoli is more my style. Me? Personally? I love Tartar. 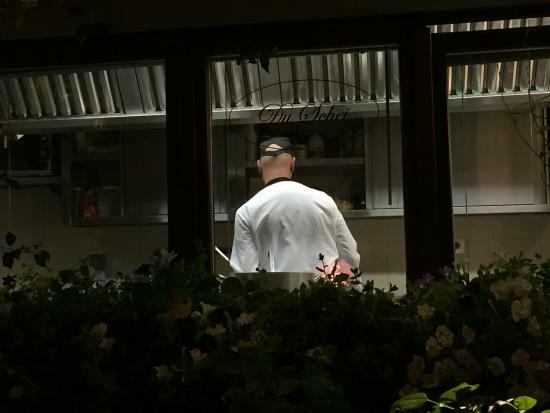 "The menu that we have at Tre Marchetti is high quality and the best of the best. We see International tourists every year and the Japanese are coming like crazy. They love to order all the specials on the menu and they share all of these. Which is special to us since each dish is exquisitely prepared. Yet it is fun. My house, Tre Marchetti, is a model of eccentricities and a strange place!" he says. " White truffle risoto,Pappardelle with Red Ricioto with hare ragout, Bigoli with duck sauce, Pastisada de caval(stuffed horse stew in Amarone wine), these items are on the menu and in additon a fish prepared menu starts at 70.00euros per person and the Meat menu starts at 60.00euros per person. Yet you can comfortable eat a dish with a lovely bottle of wine for a couple of people at a nice price. Something for everybody." says Matteo. And Roberto, the waiter says laughing, "My friends usually eat elsewhere, only special days do they eat here!" Mauro, the Capo, is just as nice as can be. With a cozy boutique restaurant that, "specializes in only fish. I had a 30 year restaurant on the outskirts of Verona, which sat 120 people and specialized in raw fish and fresh fish, the first raw fish restaurant in Verona at the time; although many restaurants were starting to do the fresh raw meat which is tartar, I started the raw fish menu years before anyone else. That is what we specialize in here. We have maybe 5 items on the menu that are not fish, including the two on the antipasti starter section. Fresh fish. That is what I do. Maybe a little bit more expensive than most restuarants since real fresh fish is very expensive." "Inside it is romantic and private, which is the way I envisioned my boutique restaurant from the beginning and outside under the historical arch and pillars, we have tables in the summer. The tourists, of course, love the outside since they love the fact that they are sitting under a medieval structure, the locals? They are used to it. They care about the food. And I am very happy that most of my guests are local. That says a lot about the quality of my food. 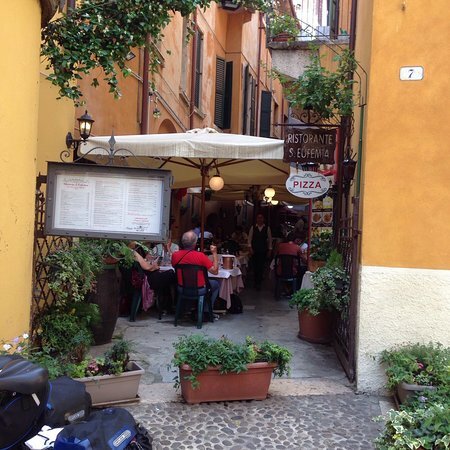 When the locals love the food, the tourists know that it is good," says Mauro. True. "I love my fish restuarant and I designed the entire restaurant myself. It is cozy and elegant and the dark heavy wood carved chairs and sophisticated yet modern lighting is all to set the mood of romance and privacy. The people that come to my restaurant know that it is about 50.00 euros or more per person and they come to have a lovely night here. I am happy although it has taken me 3 years to build the reputation as a high quality fish restaurant," says Mauro. He invites me to dinner that night to try his fresh fish and I try a octopus anti-pasta and a lovely pasta spaghetti and clams entree. Light and perfect. Loved it and especially loved the conversation with Mauro. The minute I walk into the very elegant yet eclectic restaurant named LISTON da Barca, I am charmed. The restaurant itself is sophisticated and warm with holiday greetings already up, and the team and Capo, Miro, are the best. Miro is standing at the desk and is dignified and courteous. Professional and friendly and his team smile the minute they hear his voice. "I am happy that you noticed that," he says laughing. The team smiles and giggles as if they know their boss is going to give a funny interview, which only shows how much he is respected and loved by his team. "I hope that is the way. You know I train each and everyone of my team and if I ask a person that works for me to do something, you can be sure that I have done that task before. I do it all," he says. Since Miro shows me himself making the fresh pasta in the video, I ask him if he, too, is the cook? "I do love to cook and I make the fresh pasta everyday, not just here for show, yet I am the person that greets the guests and makes the guests feel at home. I am happy when I am on the floor, as we say. In front of the guests and giving them the highest quality of service that I can. My place I try to give a sense of service. That is what the guests remember." HERE THE GREAT VIDEO OF MIRO! "I've been in the business 36 years, and I know how to treat a guest. It is all about service. 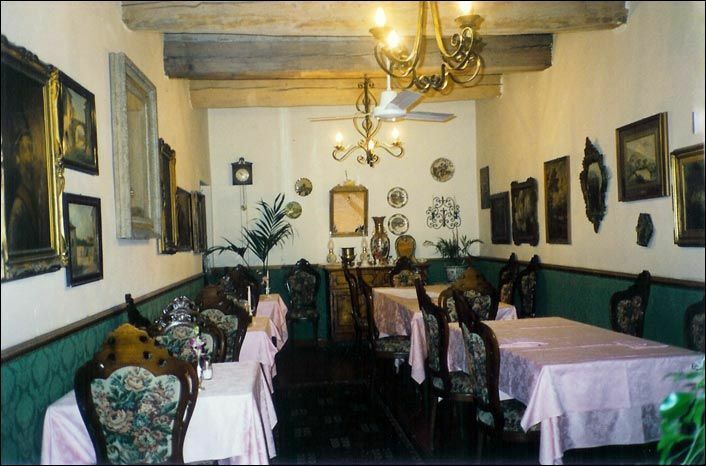 The restaurant has been here 46 years and had a good reputation as a traditional Italian restaurant, yet the decorations and the glasses, the plates, and the gorgeous wood carvings on the pictures is from Matteo. 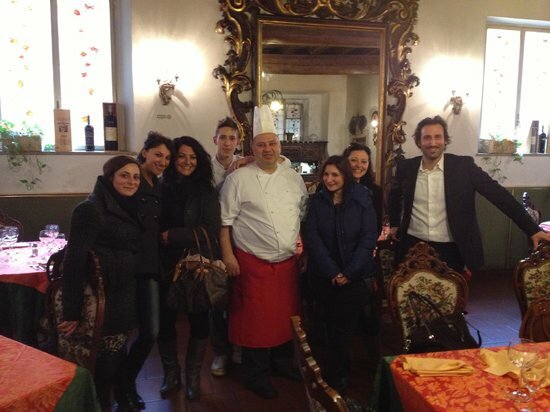 The first thing to do when Matteo bought the restaurant 2 years ago, he buys all new!" he says. Case in point the new house wine decanter! "See that, it is very sophisticated and we only serve the house wine in it! When Matteo asked me about the concept of making the pizza famous here in addition to the great meats, fish and pasta, I told him that we had to invest a lot of money into the pizza. People can eat pizza anywhere and you have to have something special. And we did and now I can proudly say if a reservation calls on the phone that we have the best pizza in Verona, highest quality of service and very good food." "I worked for Matteo many years and his father and I would definitely say that I am a friend of Matteo, even more than a friend to be honest with you. I appreciate that he trusts the restaurant Liston da Barca to my direction and right now, today for instance, he is out jumping horses, since that is his passion and hobby" says Miro. "I don't have a hobby, only my wife!" we start laughing. "I truly love my wife and my job. I love my team and we have fun with each other, yet we remember to try to make the service, the food and the wine of the highest, professional quality and every guest that walks in the door receives that service." I ask about the food as Miro gives me a plate of tiny cuttlefish, which looks like a baby squid, and peas on top of polenta, my favorite. He wants me to try the Tagliatelle, although in the video he is making Tagliolini, he also personally makes my Tagliatelle, and we share a little. It is scrumptious. "It is so soft and like butter, it melts as you eat it," I say and he says that is the way with the freshest pasta. Now I must try the homemade bread that they make, which is warm from the oven. LOVE THAT FOOD! "We have gotten great reviews and compliments the last 2 years with me as the director of the Liston and Matteo as the Capo, yet I have a very big restaurant. At least 200 people can sit to dinner at one time and of course you can't please everybody. Some people love it and then few people don't, yet that is life, right? Sometimes you have people such this way. The important thing to remember for me is that you are professional to all." "Tonight, for instance a party wants me to carve the meat from the specialty cart. The meats we serve from the cart to the table include: cow's tongue, baby cow's head, and a variety of beef, and the people can request a different meat of their choice. It is a personal service that I enjoy. Yes, you can request horse or donkey, yet it takes 10 hours to marinate that and you have to give us time. It is a tough meat," says Miro. 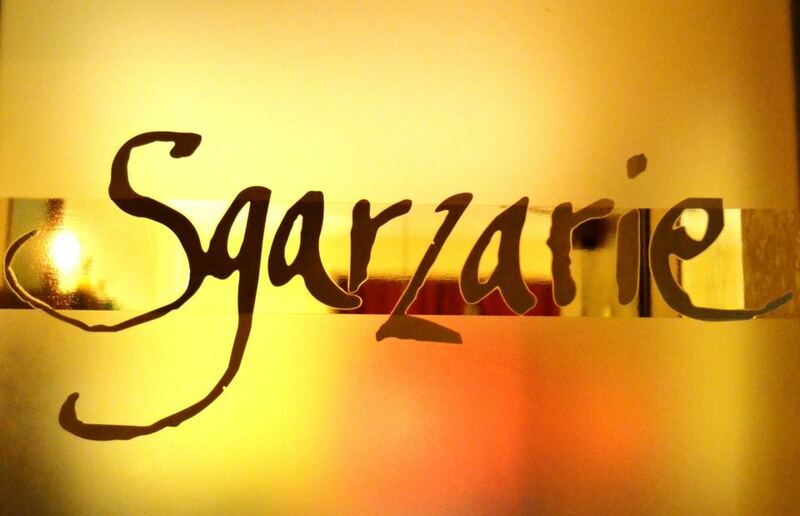 Yes, the atmosphere at the elegant restaurant is playful, the pizza; the best and the service untouchable! The amazing detail about the restaurant is that the pizza ranges from 5.00 euros to 12.00! "You know times have changed, Emme," says my friend Luca of the last 6 years. "I know that you loved the good old days, yet for me it was too much stress. Now I am happy, life is easy and my guests are very nice people coming from everywhere, especially America and China. I eat healthy now since my German wife makes me do that and I am a little chubby, too!" he says laughing. Luca is always happy. Either or I am always making Luca laugh that could be the case! "You should try the horse meat, the cavallo, I know that since you had a horse you don't want to eat your pet!" he says laughing as I squish up my nose. 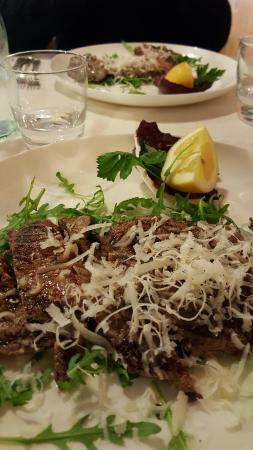 Horse meat is a delicacy in Verona and everybody serves it on the menu as such. "I see a lot of different tourists the last year than ones we are used to. A lot of Americans come and you can hear the language on the alleys and at my tables. I am happy to talk to these new people. They alway say, "O Luca, we loved the food!" and that makes me happy. I am most happy when the guest is happy and I come to say hi all the time. They always laugh with me and they love my picture and they love to take my picture although I rub my tummy and say I am too chubby, yet they say, "We love the chef!" and they take my picture." says the very kind Capo of St. Eufemia. 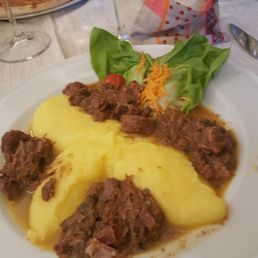 "They love the polenta and braised beef, or we have the polenta with the horse, which Americans usually don't try although most other cultures do. Except we had people from Qatar and they said to take all the horse dishes away from the tables and we had to serve only the others!" Um yes they love horses. Capo Luca's waiter who makes jokes with the guests remembers me and my chatting with the table next to me in the last years and everybody says hi and invites me to see the wine cellar and to have a special table. A glass of bubbly is immediately at my little place and I notice that while Luca might not have the black and white tuxedos, he still has the lovely and professional service. Luca is a doll, he has been at the family restaurant about 35 years now, and he is always improving and adding to the already famous Michelin Star Restaurant. "It is Michelin quality, yet the Michelin status is when we were all white and black tuxedos and formal. The prices were very high in the 1990s and early 2000 since the Italian people and tourists spent all the time and everybody had money! I noticed that the tourists became more family oriented and friendly and brought the children and now my restaurant is family focused." says Luca.SINCE LUCA IS THE STAR of the 33 year old restaurant named Ristorante S. Eufemia which "used to have jackets only...black and white tie please to enter and dine here in the era of my mother and father, now I would love to enter the modern age...you know honestly I never wanted to be a cook...I entered university to do economics and wanted to do something real important with my life and I had to become a cook...my father was the master chef and I learned from him...says Luca. "Now we have a new social media program and we have a new website and I enjoy doing these items. It is actually fun to see my new website." "You know, my restaurant is very traditional and we are making pizza now for the first time ever. I thought, yes I make great fish dishes and great meat dishes, yet people come to Italy to eat Italian food and that is pizza and pasta. You can have meat and fish dishes at almost every country, yet Italy is famous for the pasta." says Luca. I met the Capo, Ivan and his best waiter of many years, Walter, at the very Old-School and very traditional Trattoria Reale a couple of days ago. Yet on Monday, we met the son, Matteo, who is busy and efficient! So busy that we are facebooking back and forth to ask a couple of important questions about the restaurant. Yet here is a little taste that is with elegance and sophistication and luxury. 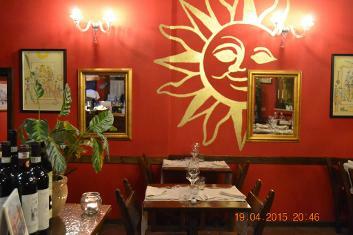 I guess that is the way to best describe Trattoria Reale. 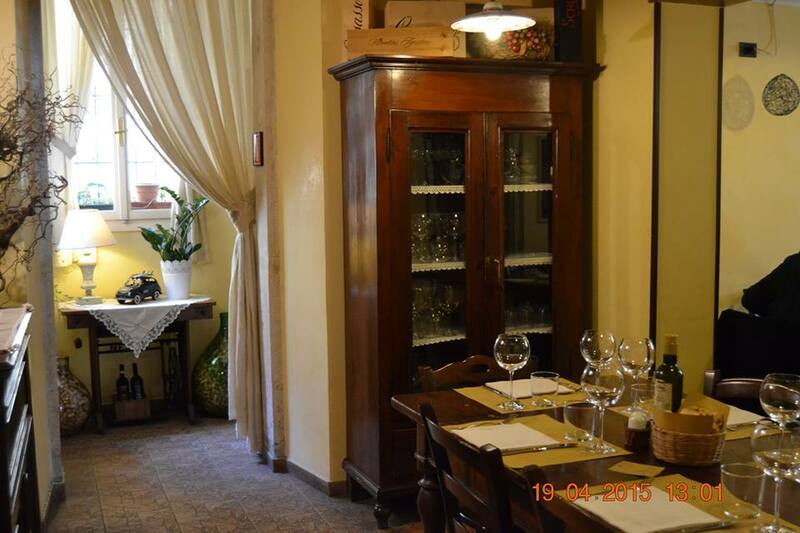 The Trattoria Reale is perfect if you are having a romantic dinner or intimate party. Yet, "We have many families that come here. Children are welcome, as long as they love opulence!" "I speak only a little English," says the Capo, Ivan in 100% Italian! His right hand man, Walter, translates the words to me and he is totally funny and actually one of the best translators the world has! I speak and the words are immediately translated in Italian and then Walter stands respectively at attention and waits til I speak and he immediately translates! It is funny and actually I tell him he should have a job at the United Nations! "He wants to tell you that the restaurant has been opulently redecorated only the last couple of months and he is in the process of redoing the website and adding social medias of facebook and perhaps instagram. He wants to show the world his restaurant." says Ivan and Walter happily. 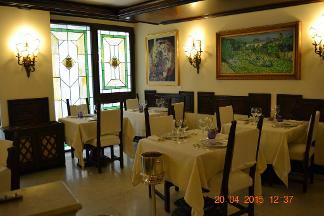 It is a very beautiful restaurant with heavy curtains and ornate gilded lamps and table settins of linen of course. Gorgeous atmosphere and the service very professional. Which is why when I finally met Ivan's son, Matteo, we had to reschedule since he said he must do catering and attention to his guests. I understand totally. That is the important reason we are open for business. Guests! 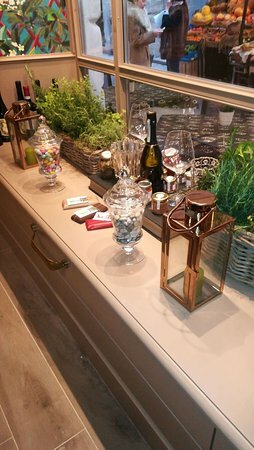 "In addition to the remodeling and the addition of the new room, which of course we have decorated to match the old traditional style, we have a lovely garden that faces the pillars of the 15 BC architectural stone building that is in the small piazza. The city does tours to see underneath the building and perhaps soon they shall ask us to do dinner and tours which would be very lovely since it is right at the face of the garden tables." says Ivan. Walter is busy waiting on his many guests that choose to sit outside on such a beautiful day and with his professionalism keeps apologizing to me saying that he must put the guests first! Can't wait to tell you of the funny interview of Davide Veneri, the capo who owns the lovely all Verona Traditional recipes and products Osteria Verona Antica at Sottoriva 10...ALRIGHT READY? "Let's say that you ask to eat fettucine porcini and it is out of season or you ask to eat seafood from the Adriatic sea. I say does it look like we are on the sea? If you want to eat seafood go to the sea, here it is Verona. One thing that you should ask when you come to my restaurant is "WHAT IS THE SPECIAL?" and the next thing that you should ask is "WHERE IS THE KITCHEN?" and ask to see both. You don't have to ask about the drinks, I suggest something with every meal. If you still want the coca cola with the lovely T-Bone steak I can't make you drink a fine regional wine from Verona yet I recommend it." says Davide and being totally serious you listen. "It is important to understand the regional dish of the day and if you come to Verona you eat from Verona. If I am a tourist I eat the regional dish of the day in Verona. For instance people ask me the difference between Wild Hare on the menu and Rabbit. I say that it is the difference between a wild donkey and a horse, a pig and a wild boar, a wild hare and a rabbit. The Hare is more wild. The rabbit is fat. And I say use the brain use the brain to do seafood go to the sea and to do things from the forest come to the forest. 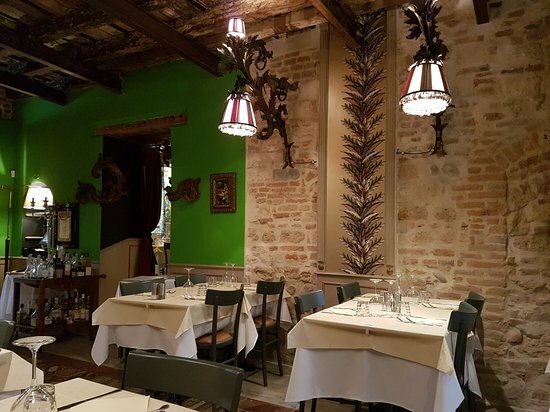 We are near the forest and we serve items from the forest such as wild hare, wild boar, wild donkey and yes horse since it is Verona and that is traditional. My restaurant is all traditional. All of it." he says trying to make a point of things to eat at his Verona restaurant. "They ask all the time, do you have pizza and spaghetti and meatballs? And I tell the tourists that only in America do they eat the pizza and spaghetti and meatballs and we don't even make meatballs with spaghetti anywhere in Italy." When I ask does when does he have wild hare on his menu and when does he have rabbit which is the season for which. "Both the same," he says. "My team is cool, and I do love to cook yet I have 3 cooks. One is old and one is young and one is here 5 years. It is a lovely blend. We have Gnocchi and Bigoli that follows the season and we have truffles when it is truffle season. Today we have Fettucine with green peas, and we have fettucine with asparagus and we have fettucine with yellow mushrooms. The aspargus is in season and that is the special today. I try to educate the tourists and let each tourist know the season vegatables. They're used to have a lot of products and then here they have vegatables. Why does a tourist ask me if I have pineapple in winter. Go to Hawaii. Here it is all from Verona." When I ask when he does cook? "I went to Hotel school to learn to cook. Everybody in Italy goes to professional school to cook or they apprentice. I went to Hotel School." he says. And where? "Verona." Of course I should of known. And how long is the school? "3 to 5 years, " he says. And in Verona how long did you go to school in Verona? "5 years in the Verona school. That is why the Italian food is known around the world. Since we are trained on how to use the spices and the products and the seasons for each. We take a long time to learn it all and we apply it." Says the Capo of Osteria Sottoriva. "It is about common sense. When a photograph or a cooking show does something they come here and say I want that on that cooking show and in 5 minutes! I say it is common sense. At the south of America is Tex-Mex since it is near Mexico, at the San Francisco ocean it is seafood since it is near the sea, and here in Verona it is Verona since we're in Verona." he says. "At the day it is a pleasure to prepare local dishes for the tourists. At night I am tired from being here 13 to 15 hours a day, yet I resist to insist, I resist to insist yet the tourist that comes in here at 22.00pm when the cook is ready to go home, it makes it hard to resist to insist. We must cook for the tourist." he says. And when does Davide cook? "At night, on Sunday night at home at midnight I cooked Spaghetti with a expensive spicy oil sauce from Sicily named Colatura." I start laughing. DAVIDE! I thought you said you only do Verona. "No, when I am at home I cook from around the world." "Verona ingredients, Verona wild boar, Verona wild hare, Verona wine, Verona homemade pasta no pizza do I tell the tourists..." says the lovely Verona only 5 year schooled in "Verona Hotel Schools..." and at the end of the 2hr. Verona interview I ask Davide what is written on the chalk sign on the sidewalk? He says totally serious..."Pizza!" DAVIDE! I say you just got done saying only Verona homemade no pizza..."yes but the tourists always ask for meatballs and pizza...they love it!" 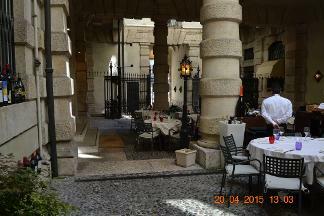 The restaurant is wonderful and right on the cobblestoned alley or a wonderful balcony view in the river garden. And the team is lovely. 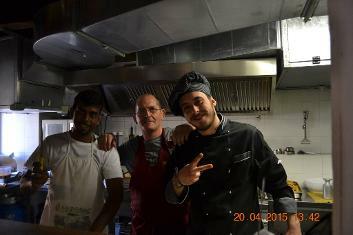 Dario, the owner kept walking around since he is very busy yet invited everybody to come try his Verona cuisine! Mamma Mia! That is the traditional saying of Italians and people around the world...however at the famous Greppia, the mama Giovanna has for the last 45 years made the home-made pasta for her family. The son took me upstairs to see her making Green Raviolis which she let me taste. The husband even made a elevator for mama to work in her laboratory. "We have about 45 years of traditional famous homemade pasta and that is why people come...my mama makes it every day 3 hrs. 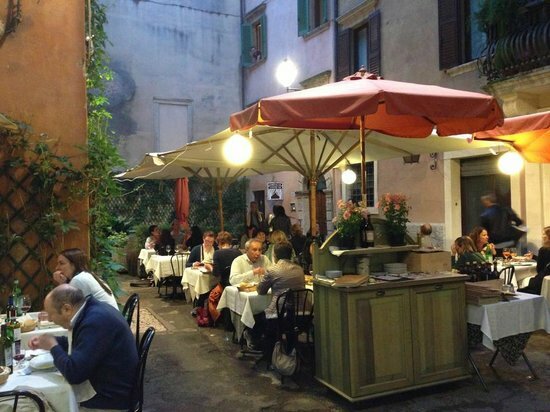 We have the only private outside garden that is hidden between two alleys about 125 meters from Juliet's house...the best location in Verona!" he says. 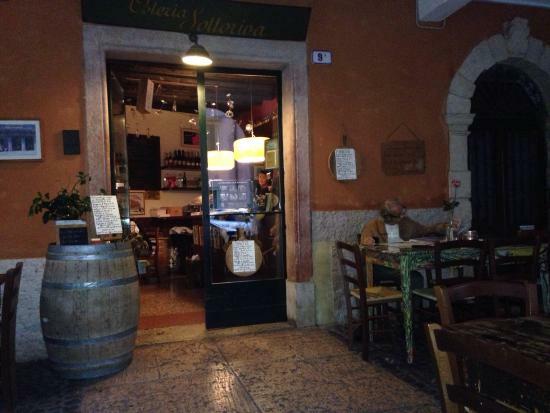 "The traditional dishes of Verona we have...we are famous for the cavalla which is the horse meat. People from Verona know that is a delicacy. 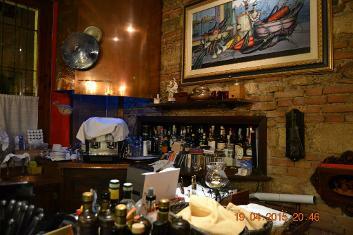 We have cavalla tartar and other famous dishes and the gnocchi and the Bigoli." Luca says and laughs when I am squeamish about the horses. "We at Verona serve Donkey meat too. The specialty of the restaurant, though, is the meat trolley. I love to say that I come to the table and prepare the meat myself. Depending on the day we can have up to 12 meats. That is the real famous dinner at Greppia." 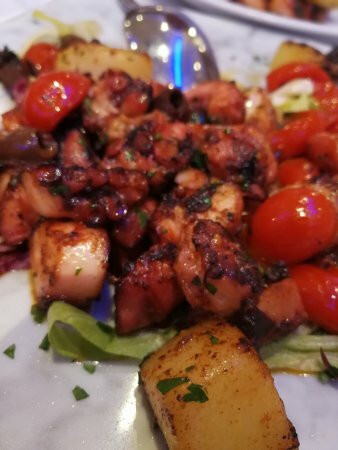 003 9 045 800 4577...if you want to be brave and try the traditional dishes! The famous restaurant is named Greppia since that is where the horses ate in the stables of the tavern. Now they serve horsemeat! Which is funny seriously! Downstairs is huge bricked vaulted ceilings, "my father and mother uncovered the downstairs when I was about 18...and they found the most beautiful brick ceilings and walls. In the winter the people love to eat here yet in the summer since my mother makes all of the pasta we have the upstairs and outside. Can you imagine my mother making over 200 plates homemade every day!" Luca jokes..."My favorite thing to do is see my mother and father when they have a day off..." says Luca. We see a old man riding a bicycle with bags of meat on it..."That is the same man that has given us meat the last 45 years, yes it is true...on his bicycle." The restaurant itself has a green garden outside and is right next to Guilietta's house...about 80 meters away. "Yes the tourists love that ... and it is fun seriously to meet people from everywhere in the world. That is what Verona is famous for isn't it? The Romeo and Juliet." "In the morning at 8:30am the first thing that we do is turn the music on...we're singing and dancing and we love the music. If people love the jobs they keep doing it. Because we live here. We're here about 70% of life and we must live here so we must turn the music on and dance and have fun." says the alive and totally normal! Luca. "I am the sommelier and for the last 2 years have been the official one here and for the last 4 years have drank the wine...so I can say I am expert on wine!" He stands outside and greets the guests as he chats with me. "We have about 125 local wines. I know everyone and every Monday if my son is alright and my girlfriend is alright I take a trip to the vineyards and I try the wine. Every Monday. I can help you and tell you which wine is better with the Fettucini which we have everyday. The Quintarelli giuseppe wine is my favorite yet it is a little too heavy with the fettucini. We have typical lunch here for the tourists and for the locals and if they want a typical lunch we must give a typical local wine." he says. "Hmm how did I start a restaurant? I don't know I don't know..." starts funny Marco. When I say do you know anything about running a restaurant? He starts laughing hysterically, "No nothing I don't know.!" and that is how it starts. "I finished my university and I am into culture and when I come back my brother, Alessio, who is a wonderful cook, says, "let's open a restaurant." and I say alright and we buy Arco dei Gavi." And what does Marco love to do? "I love to cook." he says. And I say does he cook in the restaurant? "No not at all. Alessio cooks and won't let me in the kitchen." Okay funny again. "I talk to the people and tell them to drink the Verona wine and the Mantova wine since that is where I am from and that is what they should drink." OKAY! "You must come during Carnival for the Gnocchi Festival where one day in Verona everyone must make Gnocchis and only Gnocchis can you eat!" he says as he shows me the funny pictures. 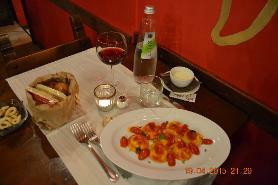 "Here we have 10 versions of Gnocchis including with tomatoes, cavallo, cheeses, you name it we have it. Alessio makes all kinds for the people all day long!" Alessio speaks Italian and we could communicate a little when I tell him, along with the very packed restaurant at lunch, that his food is bella! And he smiles and says grazie! The mom, Celestina and Nicola, father, help out. "Here is the boiled meats," says his mom as she pushes the trolley around the restaurant showing me. They are a REAL ITALIAN family and very funny with sibling friendly rivalry and good naturedness and from the 50% Verona people here everyday I know that they must be VERY GOOD! I must admit that us Americans and "the Great Britain and Germany a little and maybe the Russians and Asians don't try the Cavallo too much, which is the horse, yet since 1848 of the War here in Verona the men fought all the time, it was winter and the horses were everywhere. I guess back then when you ate cows or pigs, it was natural to eat horses and the Verona people eat it traditionally. The tripe too the Americans won't try. They are very conservative!" says Marco. 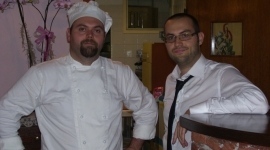 Fratellos Alessio and Marco opened the lovely family traditional restaurant in Verona about 6 years now. "Alessio is the cook and when I try to enter the kitchen and try cooking he says, OUT, that is my kitchen!" says Marco who along with Emma and me sat outside talking about the lively Trattoria Arco Dei Gavi about 1 hr. During that hr. 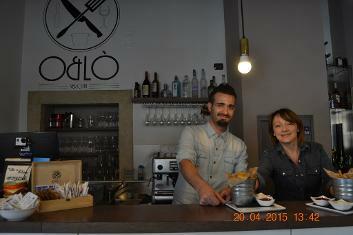 interview Marco gave me "try the Pumpkin Mousse of which we're the only restaurant in all of Mantova who makes it. It is my brother's restaurant. And the sweet wine..." he says as he gives me a little to taste. It is really good and not like the pumpkin pie or cake that we have in America. "It doesn't taste like pumpkin, it tastes light and airy. I love it!" I say and Marco keeps saying, "O it is pumpkin trust me. We have Pumpkin Ravioli too if you would love to try.!" "People are different it is impossible to make everybody happy all the time since everybody is so different, yet it is funny to be myself and hope they love me... they do trust me! 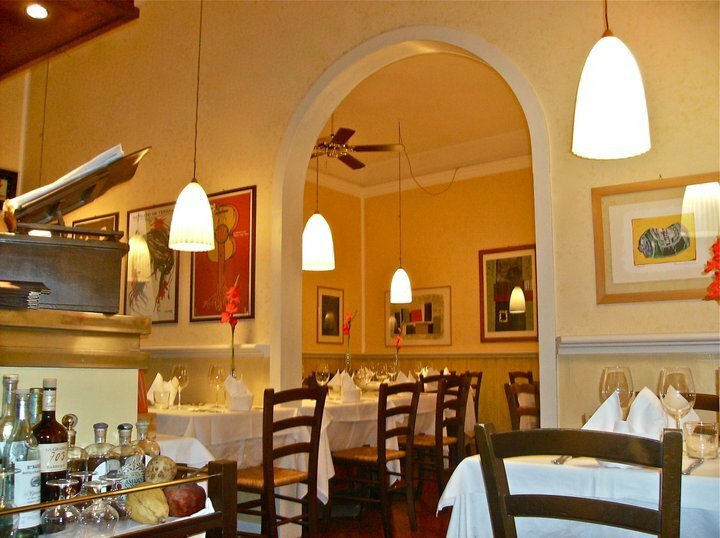 http://www.ristorantemaffei.it/ Maffei is Elegance Personified, Luxurious and Funny...does that make sense? Luxurious since it is in a Palace about 1000 years old and a ancient Pillared Courtyard that has its own private gate and entrance and funny because the owner's 25 year old son runs it. He is sophisticated since, "You know at the age of 21 it is a joke when my father says O you think it is easy to run a restaurant...try running that one. And I said O I can. I had to deal with people a lot older than me and important people that would look at me and think I am too young to be the owner. That is why I am serious all the time." he says. Yet he jokes while keeping a straight face too. Difficult! 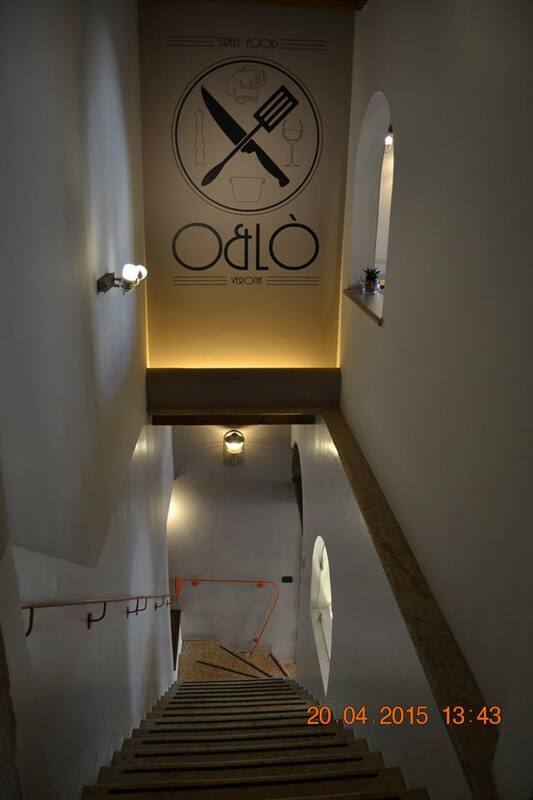 Yes above is the inside of Maffei and the Outside...yet only one level. Underneath the restaurant is a huge wooden dusky wine cellar with the tables of the Last Supper and wait one level below is ruins that they discovered while renovating the restaurant in 1981. "It is the level since 100 Century BC. That is how long the city under the city has been here. When we renovated we said O...sugar! You know we had to wait 3 years to complete the renovations since the City said that they had to preserve the ruins. Yet they let us keep the restaurant and now we show people down here and have a special one reservation only of Modern Romeos and Juliets. People come here and do weddings all the time. It is the most romantic city in the world." he says. Alright...ready to meet the owner? Lucas is 25, "Just turned 26." he says. And full of funny quotes..." You know success is hard work you can't take the elevator in life you have to take the stairs." he quips. When I say O hey that is a lovely great quote he says, "Alright I heard that somewhere. Seriously though it is creativity and finding the right colors and the right plates and word of mouth and reputation. I don't like Trip Advisor by the way. You know Trip Advisor is like a boom-a-rang. It always comes back around to hit you." I start laughing and he says, "O now that is my quote.You can quote that one...wait on second thought maybe you shouldn't then all the trip advisor peole will write bad things about me." he says. 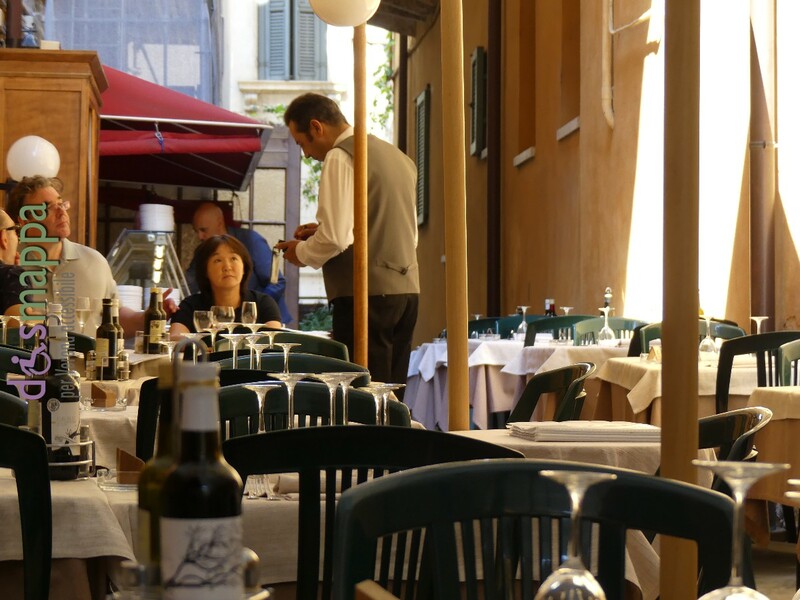 "The restaurant here is formal and luxurious yet when I opened it with me at the helm I said hmm...we need the younger movers and shakers of Verona in here. Since I am born here I knew everybody in the city. I threw an outdoor invitation only party of 450 people that had to enter the gate. Here where the baker, Matteo, is I made it into the DJ hut and we had the DJ there. And a huge party to introduce the restaurant. We're Michelin 3knifes which is great. Yet a fun place to. I figured if the young people come their parents will come too. The table here is the Romeo and Juliet table. It is 150E per person and includes a private waiter and 6 courses with all the champagne you can drink. Many people come to do the weddings here." he says as I ask him to pose. Ever do private friend parties here with wild girls and champagne when the restaurant is closed I ask. "Of course all the time." he says. Ristorante Maffei, Piazza Erbe, 38 , 37121 Verona, 003 90 45 80 10015 Tele Fax +3 9045 8005124 "And you must try the gourmet burgers at my other restaurant named Oblo..." he says and I mosey down the 95 meters under the arch gate to meet Oblo. The crazy chefs and waiters at Oblo. Marco and Anna above, "You must see the menu. Lucas designed it that every gourmet burger has a special beer that is with it. It is when you eat fish and have a special white wine. Here you eat a burger and have a special beer that brings out the flavor." I say that is brilliant and the first time I ever heard of it. 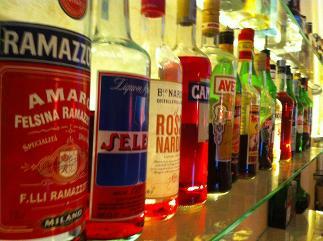 "The food is Verona typical and the region of Venice and surroundings...and the wines that we have are about 120 kinds. O and the paintings on the walls you asked about-they used to be in my father's art gallery and now here. My brother is the curator. A couple of times people have asked to buy the paintings and I must see the price and then I sell the paintings to them!" "My real love is whiskeys and behind the bar is a collection of all of my favorites. I guess when you ask what I love today about being the boss is little things like this. I can put any kind of whiskeys here that I want. I am the boss." he says laughing..."24 years now when I first started I was happy opening the restaurant and today when I wake up I have the same feeling of happiness. I love my restaurant yet owning a restaurant is a big responsibility. It is a Golden-" and he make the gesture of his wrists together-he laughs. "It feels like this sometimes." Alessandro says, "Under the beautiful outside stones is a architectural wonder that is from 15 .BC. The city does tours almost every day and we're working with the city in the future to coordinate maybe dinner and a archelogical tour. That brings the history of the location together." The location is superb by the way...just check out that picture! Seriously check out the location and view...how beautiful. "The city of Verona says which colors of tableclothes we can use and the style of the furniture in the outside historical structures. They want to keep that traditional style and feel to it all." Alessandro says. "You know the city of Verona is a romantic city with the Romeo and Juliet story. They were in fact real families from Verona although Shakespeare embellished their story I think. I don't know if there are any Montagues or Capulets living in Verona today." Alessandro says when I ask about the tale. He is born here yet visited Mexico when a friend of his told him of a opportunity to open a restaurant on the California side of Mexico. "I went to Mexico and fell in love on the spot. I opened a beautiful Italian restaurant on the Marina. I owned that and went there in the winters til 2010 and it finally was too much for me back and forth all the time. Now I only have the restaurant here that I love the last 24 years. And of course my new project which is my own Tequila in keeping with my love of Mexico, it is named Mexita and is in the process of being produced." he says happily and shows me the Mexita label...a combination of Mexico and Italy. The restaurant is hidden and intimate. A perfect romantic hideaway in the most romantic city in the world...where the lovers Romeo and Juliet lived. "Yes of course I know a little about the story" Francesco says, "One time since moving here I had to visit the Juliet house. And you know here is a Romeo house but nobody ever knows about it." he says. He shows me on the map where it is located and at 10:00pm on Sunday night I navigate through the city and find the hauntingly beautiful house. A famous dish from Naples is brought to me. Saucy raviolis. Yum. "Which dessert did you chose?" Francesco asks and I say that I chose the ricotta cake with pears. "O that is a good one." he laughs. "Me as a young boy I never liked dessert. As a matter of fact when little at my birthday parties all the cake would go to everybody else. I never wanted any birthday cake." Really? I say. Hard to believe that a child doesn't like birthday cake. "Nope. I never even had a piece of my own birthday cake growing up." Wow. Alright for the rest of the people in the world that love cake...yum again. The famous arena of Verona where Robbie Williams is playing June 14Th Cool and most famous operas all year round.